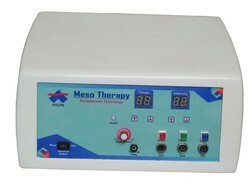 Our product range includes a wide range of mesotherapy machine. Leveraging on our rich expertise, we have been able to meet the needs of clients by offering a superior range of Mesotherapy Machine. Featured with LCD display, feather touch keypad and user friendly function, these machines are used to stimulate the skin tissue and improves the permeability of the cell membrane. Our Mesotherapy Machine is designed and manufactured by our professionals as per the set industry norms using supreme grade materials. Be it in domestic market or international, our offered chemicals are cherished and acknowledged over the global platform. NO needle Mesotherapy are advance technology when using active ingredients as it will help infusion of the product deep into the dermal layer of the skin. Use Ultrasonic vibrations at 300 million times per second. This treatment also improves the appearance of fine line and wrinkle. Ultra sound also generates fractional heat that will improve blood circulation , relax muscles and break down the fatty deposits to reduce cellulite.